This project will provide better links for Northern Motorway (SH1) travellers in Auckland and improve transport options on the North Shore for freight, cars, pedestrians and cyclists. It includes a new motorway connection between SH1 and SH18, opening up access to the Western Ring Route and airport. To help facilitate interregional travel between Auckland and Northland by allowing the full benefits of the Western Ring Route to be realised by upgrading the SH18/1 connection. Widen SH1 in both directions for those travellers who stay on SH1 through the central city. The Northern Corridor Improvements (NCI) project will build a new direct motorway-to-motorway connection on the North Shore, providing a new and efficient direct route for commuters and freight to travel to and from Auckland Airport, West Auckland, Manukau and Hamilton. 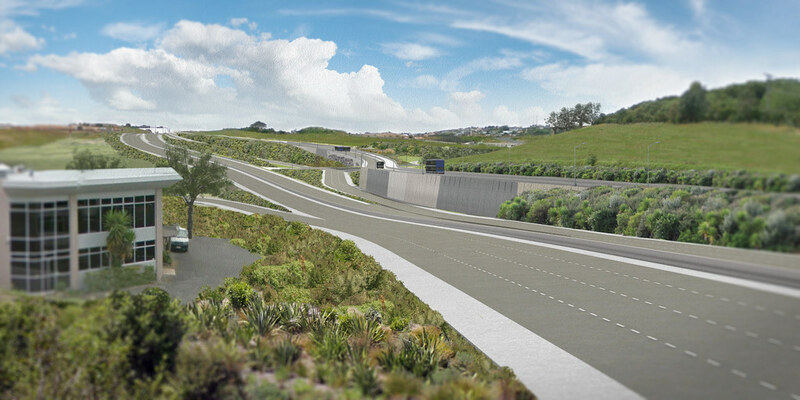 The new link will connect SH1 directly with a redesigned Upper Harbour Highway (SH18), opening up access to the new Western Ring Route (upgraded Northwestern Motorway (SH16) and Waterview Connection (SH20) and SH20A to the airport). At the moment, SH1 is the only main route between Northland and Auckland and faces significant congestion, particularly at peak times. Pressure on the motorway system around the Albany and North Harbour area has grown substantially in recent years and is set to become more intense with continued increases in population, housing and freight movements over the next 30 years. Creating a new direct motorway to motorway connection will allow travellers to avoid travelling through the central city and keep local roads free for local traffic by separating motorway and local traffic. The project will also include an extension of the dedicated Northern Busway from Constellation Station all the way through to Albany Station, improving journey time reliability and time savings for passengers on bus services. As part of the project, upgrades will also be undertaken at Constellation Bus Station [PDF, 450 KB] and bus access at Albany Bus Station. 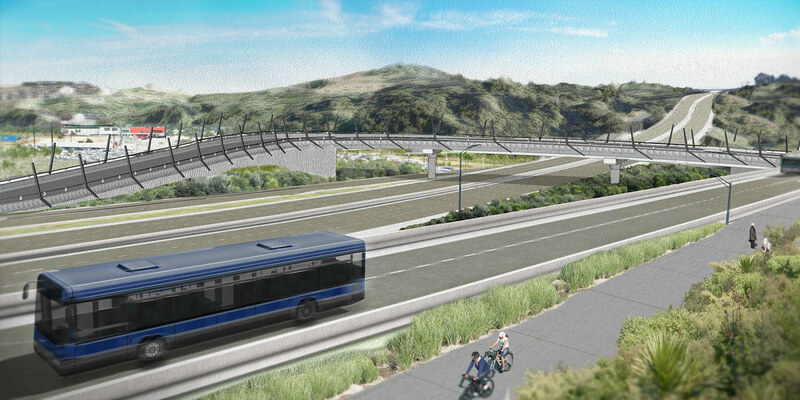 Auckland Transport is also investigating an additional bus station in Rosedale, which would increase access to bus services for a key employment area. The first of the Northern Corridor projects to begin, the Upper Harbour Highway to Greville Road Northbound 3-laning project completed construction in June 2015. This aspect of the longer term programme was accelerated as it would provide interim relief for the community and increase capacity while the rest of the rest of the programme continued to be investigated and designed. Key features of this project included constructing an additional northbound lane on SH1 between the Upper Harbour Highway on-ramp and the Greville Road off-ramp, upgrading the intersections at the Greville Road interchange, and building a dedicated shared path for walkers and cyclists to travel safely through the area. This part of the main works will build a new direct motorway connection between SH1-S18 near Constellation Drive, and upgrade Upper Harbour Highway (SH18, currently a signalised 80km speed zone) to full motorway standard, all the way from the new connection through to the Albany Highway bridge. The new connection and new on and offramps will separate motorway-through traffic from local traffic and improve local road congestion, including at Constellation Drive. 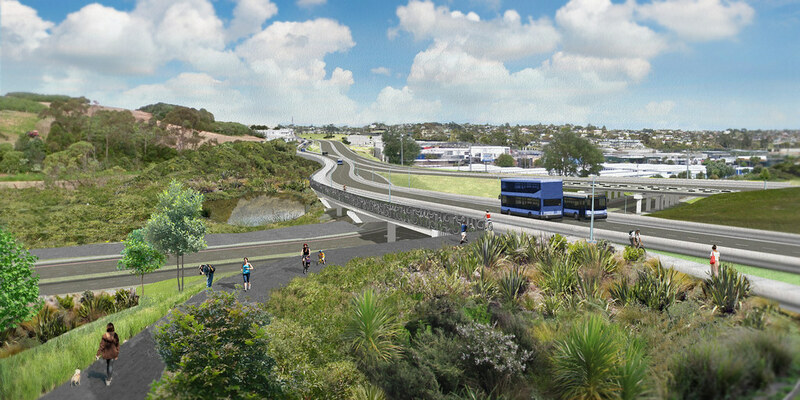 This project forms the final missing link of Auckland’s new Western Ring Route. The current congestion and conflict of motorway-through traffic and local access traffic through Upper Harbour Highway (SH18), as well as rapid growth in the industrial area at North Harbour has created a divide between the local community to the west and south, and the industrial area to the north. There is limited accessibility for safe walking and cycling around the highways and to and from the busway. Improving facilities and encouraging these ‘active modes’ of transport is a key project within the Northern Corridor project. The project will deliver over 7kms of new offroad Shared Use Paths and a wide range of local road and park connections, helping to increase accessibility to the bus stations and key destinations. The project is also delivering Tirohanga Whanui (the Spencer Rd to Albany walking and cycling bridge), in partnership with Watercare. This bridge will reconnect the East Coast Bays with Albany's employment, retail and schools area with a safe, offroad crossing point. The NCI will also include an extension of the dedicated Northern Busway from Constellation Bus Station all the way through to Albany Bus Station, improving journey time reliability and time savings for passengers on bus services. As part of the project, upgrades will also undertaken at Constellation Bus Station and bus access at Albany Bus Station. The NZ Transport Agency is committed to engaging closely with iwi, key stakeholders, affected property owners and the community throughout the entire project life cycle. Read our Public Consultation page to find out more about how we’ve engaged with everyone during the option, design and consenting process. On 22 November 2017, the project was approved to start construction, and will begin preparation works in early 2018. The size and scale of the project means construction on the North Shore will be staged over the next four years, and the project team will work alongside the community to try to minimise disruption and provide real-time travel info to keep everyone safe and moving. This website will be regularly updated with information and we will hold monthly info events. Construction on the project is being staged. The Transport Agency aims to have the Northern Corridor fully complete by 2021-22. The investigation phase identified and assessed options for the Northern Corridor. A thorough process of public engagement was undertaken at key milestones, leading to a preferred alignment plan being developed. The Pre-Implementation & Consenting Phase prepared and submitted environmental and social assessments to the Environmental Protection Authority, which oversaw a Board of Inquiry (BoI) in Mid-2017. The BOI announced approvals for the consents and designation on 22 November 2017. This phase also included the development of formal preliminary design and engineering plans and a procurement strategy for the following construction stage. The construction alliance team contracted to complete detailed design and construction of the project is expected to start works in early 2018. The size and scale of the project means construction on the North Shore will be staged over the next four years.